So, I was watching Parenthood and suddenly it dawned on me that our household is like television drama. There is always something! If you wrote our lives as a script it would be turned down as too implausible, too over the top. Take today for example. You know the week we have had, right (if you don't read my last post, I dare you)? Well, today I thought I'd put all that behind me and go and enjoy some great company and a coffee and some cake - and that is just what I did! I visited two friend's houses (wow!) and it was lovely! Then I arrived home and in my email inbox there was a letter from our local kinder telling us that the four year old kinder assistant has just tendered her resignation today. Okay, so maybe that doesn't seem like a big deal, except that we've enrolled Ari in this kinder - which we are not zoned for - only because of this particularly brilliant kinder assistant! With my agoraphobia, I was relying on her familiar and very welcoming face to ease us back into the kinder scene and now she won't be there and the kinder teacher Bryn had also left early this year, so basically we won't know anyone. If it weren't for the fact that I'm now so used to Murphy Law's putting the boot in, I might be devastated by this news. As it is, I find myself smiling at the inevitability of it all. Of course she was going to resign! That is completely and utterly in step with everything else in our lives! Actually, I'm happy for the kinder assistant - she is lovely and she has a dream she is going to pursue which means she will be able to touch the lives of so many more children in our fair city and that actually makes me happy! Child oriented people like her are quite rare. She not just patient and funny and enthusiastic, she genuinely cares about the children in her care and their families. She was so warm and friendly on Wednesday last week at the kinder AGM and came and chatted with me for a good ten minutes even though there were plenty of other people to meet and greet - she always made us feel welcome and safe. So, drama is something we tend to deal with a lot and for some time I've found myself waiting for it all to subside. Waiting for the time when we'll manage to get all our ducks in a row and start to live normal, sane, unmessy lives. That time will never come. Maybe it's our personalities or maybe it's purely a numbers things - maybe we have too many people in this family for it ever to be truly crisis free? I don't know, but the roller coaster ride is not slowing down any time soon, so I need to just accept that. If I can manage to accept the stuff that seems unfair or ironic or unnecessary, then maybe I can just get on with it all and that will lessen its impact? Possibly the worst part of drama is wishing it away because doing that only seems to compounds the bad feelings. If I can accept that things mostly can't be the way I wish they were, then I'll be less anxious; waiting for the other shoe to drop? 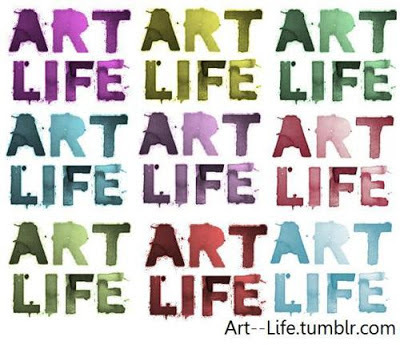 Art doesn't imitate life... Art is life. You are so right lovely, if you can't change the circumstance change your perspective. Also just want to let you know that one of the posts your linked with in widget at the bottom of the page is suggesting I might like is How Sif Got Her Groove Back.